Heat oven to 350°F. Line 24 regular-size muffin cups with paper baking cups or grease cups with shortening or cooking spray. In large bowl, beat granulated sugar, applesauce, butter and eggs with electric mixer on medium speed until smooth and creamy, scraping bowl occasionally. On low speed, beat in flour, cinnamon, baking powder, baking soda, salt and nutmeg just until well blended, scraping bowl occasionally. Divide batter evenly among muffin cups. Bake 25 to 35 minutes or until toothpick inserted in center comes out clean. Remove from muffin cups. Cool completely, about 30 minutes. In 3-quart saucepan, melt butter over medium heat. Cook 3 to 5 minutes, stirring constantly and watching closely, until butter just begins to turn golden (butter will get foamy and bubble.) Remove from heat. Cool 15 minutes. With electric mixer on low speed, beat in powdered sugar, vanilla and enough milk until frosting is smooth and desired spreading consistency, adding 1 or 2 more teaspoons milk, if necessary. 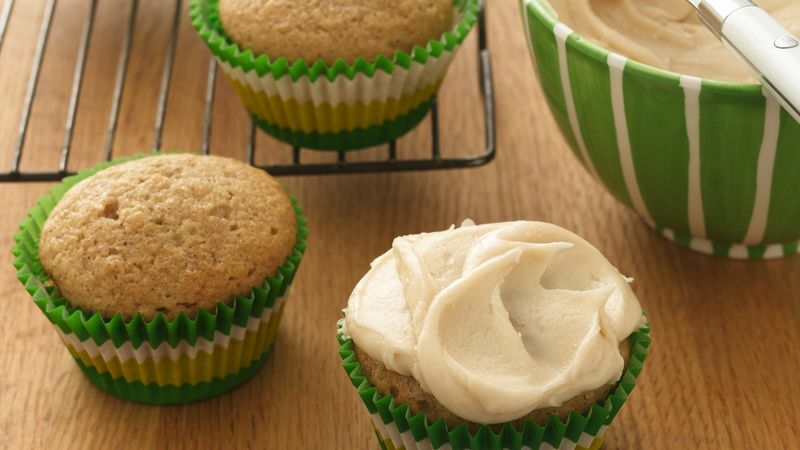 Spread frosting on cooled cupcakes (if frosting begins to harden, stir in an additional teaspoon milk).